OXFORD, Ohio – Jay Williams’ career at Miami already had to be considered a successful one through his first three seasons. 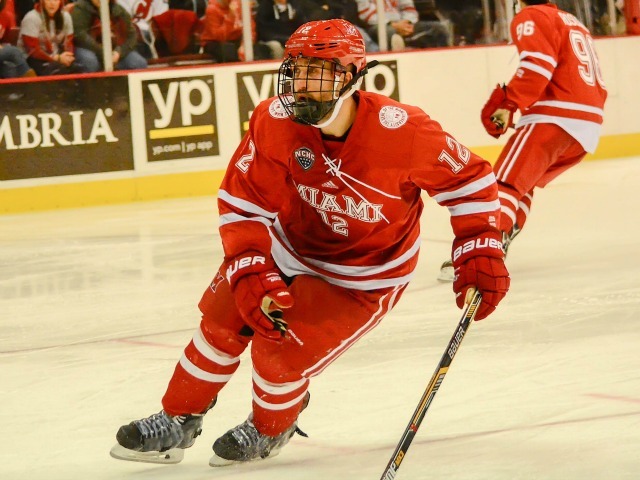 He played a major role in the RedHawks’ regular season championship in the final year of the CCHA his freshman campaign, and he led Miami to an NCHC Tournament title in 2014-15. But Williams allowed seven goals vs. Providence in this season’s opener before being pulled in the third period, miring him with an 8.70 goals-against average, and he saw action in just two more games the next three months. As a result, Williams used Christmas break to reevaluate his priorities. Due to an on-ice blow up and subsequent suspension of senior goalie Ryan McKay – who played nearly every minute of the first half this season – Williams was relegated into full-time starter mode and has been in net for all but 39 minutes since. And Miami and Williams have thrived with him between the pipes. Despite being swept by Minnesota-Duluth last weekend, Miami is 9-5 in its last 14 games as it recovered from a 5-10-1 start, and in the team’s final home series of this regular season, Williams became the first goalie in RedHawks history to shut a team out in a two-game weekend series. Williams is from McLean, Va., right across the border from Washington D.C. The mid-Atlantic region is not known for producing significant hockey talent, but Williams went to a Washington Capitals game on his eighth birthday and has been a rink rat since. Williams said as badly as he wanted to play hockey, his mother, Rosie, made him take skating lessons for a year before playing competitively. Soon after he started playing, Williams said he was given a book on goaltending and he was fascinated with the equipment. But he had to sell his parents on the concept. With goalie pads being pricey and kids growing out of their equipment on an annual basis, his parents wanted to trade in his first set for bigger pads, but Williams wouldn’t let them. He told them that they would end up in the hockey Hall of Fame. In 2009, Williams was 15 and had never attended a collegiate game. His first one? Miami’s NCAA national championship game at the nearby Verizon Center, during which the RedHawks surrendered two goals in the final minute and another in overtime to lose, 4-3 in ultra-dramatic fashion. And yet Williams still ultimately chose Oxford. His juniors experience was turbulent. Selected third overall in the USHL Futures draft at age 15, Williams went 7-10-2 with a mercurial 3.49 goals-against average and an .891 save percentage with Waterloo his first season. In 2011-12 he was 11-5-4, 2.62 and .904 but was traded to last-place Sioux Falls at the deadline. He finished 2-8-2, 3.78 and .882 in 12 games there. Jay Williams as a freshman (photo by Cathy Lachmann). Senior forward Alex Gacek knew Williams from when the two played in New England prep schools, and along with senior defenseman Matthew Caito, the trio immediately bonded upon arriving in Oxford. Gacek and Williams also shared a not-so-memorable juniors experience. Gacek was thriving before blowing his knee out, and then he was rushed back, stunting his recovery. Williams averaged just 26 games and logged fewer than 3,000 minutes in two full seasons in the USHL. Then he headed to Oxford along with McKay, who had won Goalie of the Year with Green Bay his final season in that league as he led his team to a regular season title and a Clark Cup, the USHL’s championship trophy. Jay Williams as a sophomore (photo by Cathy Lachmann). The pair rotated the first couple of weeks, but when McKay was injured in a game at Michigan, Williams shifted to a full-time role. He beat the Wolverines the next night and won five of eight before McKay returned. Williams and McKay alternated much of the season, and Williams tallied a 12-5-3 record, a 1.94 GAA and .924 save percentage in his rookie campaign. The RedHawks also won the final CCHA regular season title in 2012-13. 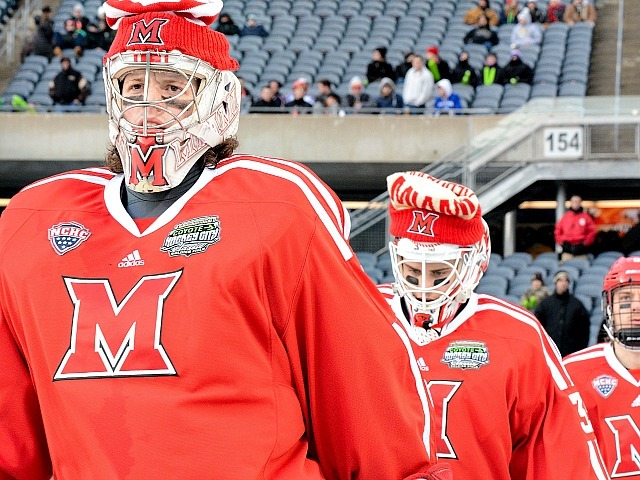 Sophomore year was forgettable for Miami overall, including the goalies. Williams recorded a 5-7 record, and his GAA and save percentage reverted to 3.30 and .882, respectively. Jay Williams at the outdoor game in 2015 (photo by Cathy Lachmann). But he was rejuvenated in 2014-15, notching a 19-8 record and allowing just 2.04 goals per game, and his save percentage ended up at .917. 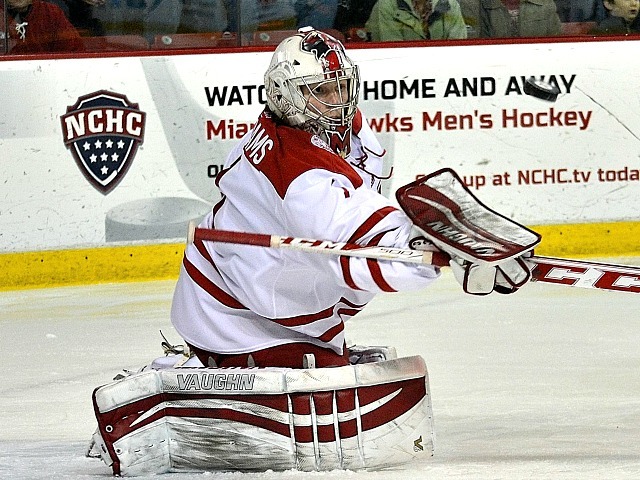 Williams was also in net for the stretch run, including the semifinal and final wins in the NCHC Frozen Faceoff, as Miami won its first tournament title in the newly-formed conference. And his five shutouts that season tied him with Knapp and Reichard for the school’s single-season record. This year, Williams is 10-7-1 with a 2.41 GAA, .909 save percentage and a pair of shutouts. But heading into the break, he had a 5.35 goals-against average and a save percentage of just .812 to accompany an 0-2 record. Since? He’s 10-5-1, 1.97 and .924. Jay Williams as a junior (photo by Cathy Lachmann). Williams will leave Miami with his name etched in several places on the team’s career leaders list. His 46 wins and nine shutouts both tie him for fourth all-time, he is fourth in GAA (2.32) and sixth in save percentage (.910). But there’s more to Williams than just his statistics. His enthusiasm on the ice rubs off on his teammates, and even when he’s on the bench he’s one of the first to congratulate fellow players. His postgame celebrations are legendary, as he seems to have a secret greeting for each player that meets him in front of the crease after wins. “Almost everyone on the team has a handshake with him or a little saying that they say, so he’s a spark plug for us, even though he’s a goalie – usually it’s a little different, it’s a (skater) – but Jay’s a great team guy that we need, and our success is really pivoted around him, going forward,” Gacek said. Off the ice, Williams appears a bit too normal for a goalie, but Gacek can attest that he does possess some of those strange netminder attributes. Jay Williams as a senior (photo by Cathy Lachmann). “Jay can be quirky at times, he can be serious at times – whatever the situation calls for, he can adapt to it,” Gacek said. “That’s why I think he’s one of the big favorites in the locker room. He will also depart Oxford with a degree in finance this spring. Williams was named to the NCHC All-Academic Team last month with a 3.38 GPA. He will look into playing professionally after this season but is currently focused on enjoying his waning days at Miami. Whether he goes pro in hockey or the business field after this season, he has set a high bar for the incoming freshmen goalies in 2016-17, both on and off the ice, and Williams has loved every minute he’s spent in Oxford. After surging above .500 last weekend for the first time since late October, Miami finished its regular season a game below that mark. The RedHawks were swept at Minnesota-Duluth, falling 3-1 in the series finale on Saturday. It was just the second losing regular season for Miami in its past 11 campaigns, but both have come in the last three years. The Bulldogs (15-14-5) opened the scoring when Willie Corrin drove to the net and had his initial shot saved by senior goalie Jay Williams, but the rebound came back to Corrin, who slammed it home 6:44 into the first period. Miami forward Kiefer Sherwood (photo by Cathy Lachmann). The RedHawks (15-16-3) tied it with 1:47 left in the opening stanza, as senior forward Sean Kuraly intercepted a pass and centered it to freshman forward Jack Roslovic. Roslovic one-touched it to freshman forward Kiefer Sherwood for a tap-in from the side of the net. UMD took the lead for good when a rebound popped into the air, was controlled by Charlie Sampair and deposited in the net on Williams’ short side 2:26 into the final frame. Alex Iafallo sealed it with an empty netter in the closing seconds. Sherwood’s goal was his sixth in eight games, and Roslovic recorded his third helper in his last three contests. Kuraly also earned an assist on the RedHawks’ goal, as he wrapped up his final regular season with 16 points in his last 14 games. Williams stopped 18 of 20 shots in the losing effort. Despite the loss, MU actually moved up a spot in the PairWise and is currently tied for 22nd. The RedHawks will return to Minnesota-Duluth next weekend for a best-of-3 opening-round series in the NCHC Tournament as the No. 5 seed. Miami is 7-2 all-time in the league tournament, including 4-1 in the quarterfinal round. But the RedHawks went 0-3-1 against the Bulldogs in the regular season, scoring just three goals in the season series. The best-of-3 will be played on March 11-13. Times are TBA. Analysis: When does the movie come out? OXFORD, Ohio – A movie could be made about this season, and it could be better than most sports flicks in recent history. Hey, they’re making one about John Scott, aren’t they? 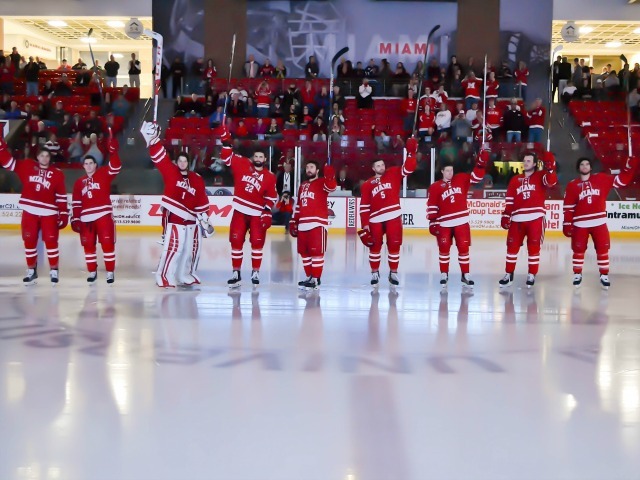 Miami shut out Colorado College, 4-0 at Cady Arena on Saturday to complete a series sweep of the Tigers on Senior Night and the final regular season home game of a number of players’ careers. A team that didn’t have enough offensive weapons (at least at the beginning of the year) takes on one of the toughest schedules in Division I and fails early – almost catastrophically so – posting a 5-9-2 first half, with the final two games being a pair of losses against one of the worst teams in college hockey in the Tigers. The team is in utter turmoil, both on and off the ice, heading into Christmas break. Then it seemingly gets worse as senior goalie Ryan McKay, who has had a stellar career in Oxford, is suspended indefinitely for an outburst as he leaves the ice. That leaves the netminding reins to Jay Williams, who couldn’t get a starting gig in the USHL and has had to share the cage with McKay for almost all of four years. Including 2015-16, when Williams was left in to allow seven goals in the season opener and then benched for almost the remainder of the calendar year, not picking up his first win until Jan. 3. Following the GoalieGate loss, the team was 6-11-3. The team has gone 9-3 since and somehow gotten itself into NCAA Tournament contention, capping its home slate with a pair of wins over Colorado College, the same team that Miami couldn’t beat in December. The finale is played in front of one of the best Cady Arena crowds in recent history. How about Anthony Louis scoring with two seconds left to send Miami to a 2-1 win over Bowling Green? Or a come-from-behind win against top-10 St. 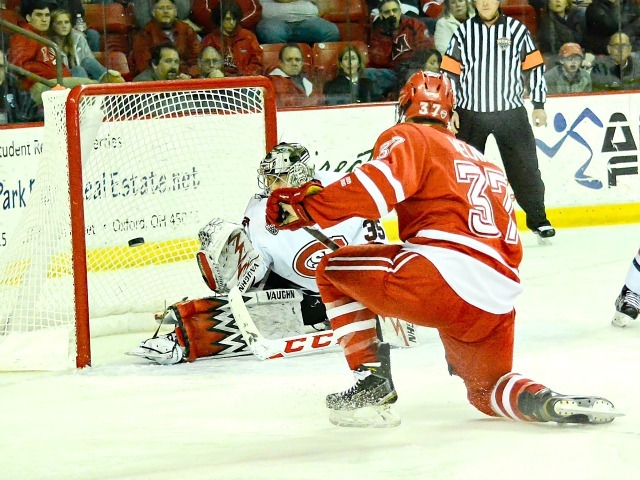 Cloud State in an action-packed 3-2 win at Cady Arena? Or another key road win at BGSU after trailing 1-0 after the first period? Or a beloved usher and huge Miami hockey fan suffering from Stage 4 cancer, coming back for that final home game in what was one of the most emotionally-powerful moments in recent memory in the northeast corner of Cady Arena? Miami’s seniors are honored before Saturday’s game (photo by Cathy Lachmann). We’ve got the characters too, most notably seniors playing their final games with the RedHawks, and all at the top of their game. There’s Williams, who was never considered good enough to start for any of his juniors teams, posting a sub-2.00 goals-against average since taking over in net exclusively. He set two school records in that home finale, one for being the first goalie to post a double shutout in a weekend, another for longest consecutive shutout streak at nearly 150 minutes. And believe us, his story is actually even better than that. Insert shameless self-promotion: BoB has a feature coming out about Williams in a couple of days. How about Taylor Richart, the bust-your-hind-quarters defenseman you just can’t help but love? At 5-feet-9 he had earn a spot on an NAHL roster and then a USHL roster before coming to Miami, where he had to overtake several other more highly-touted blueliners to crack the lineup every night and gets beat up like a pinata on a game-by-game basis. Taylor Richart celebrates his second goal in an as many nights on Saturday (photo by Cathy Lachmann). He can seeming do everything on the ice and has elevated his game more than just about anyone in his four years, but he simply hasn’t been a scorer in college. Richart had one goal in 127 games prior to this weekend. All his did in his final two regular season home games is find the net in both and earn a first star in one contest and second in the other. Rudy has nothing on Richart. Or Sean Kuraly? The big power forward who is the son of Miami’s all-time leading sniper notched 19 goals last season but couldn’t find the net with a GPS the first half of 2015-16. After bearing the weight on the world on his shoulders, he had some of his captaincy duties whittled away so he could concentrate on making awesome happen on the ice again. It’s safe to say he has, tallying 15 points in 12 games and anchoring the Columbus line comprised of the wily veteran and a pair of super-talented freshmen in Kiefer Sherwood and Jack Roslovic. We can’t forget Alex Gacek who tore his patellar tendon off the bone prior to his Miami career, and how it took years for him to regain his confidence. It’s not even debatable that he is playing the best hockey of his career. Same goes for Kevin Morris, the super-smart son of an AHL coach who has a 3.6 GPA and has posted six goals in 11 games after finding the net just eight times in his previous 96 contests. Same goes for Chris Joyaux, who has been so steady on the blueline since joining the team in the fall of 2012. Same goes for transfer Andrew Schmit, who has gotten to play with his cousin, Conor Lemirande, forming the Crash Cousins line. He is one of the team’s most punishing hitters in recent history but has just eight penalty minutes in 2015-16. And there’s Michael Mooney, who works so hard when he does get in the lineup and has saved this team’s bacon when it had battled injury woes with his ability to move into any position. Matthew Caito wasn’t able to play on senior night, coincidentally missing just the second and third games of his Miami career, making the double shutout even more impressive. 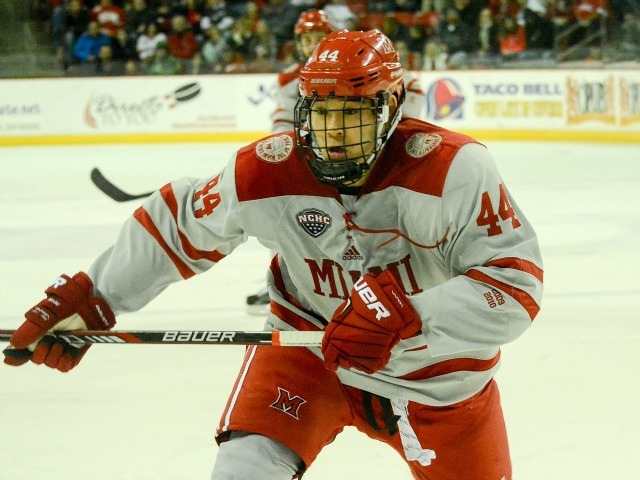 It’s unlikely his season is over, and one of the steadiest two-way defenseman to dress for this team since Andy Greene must return for the RedHawks to have any realistic chance at an NCAA run. BoB won’t forget McKay, whose .917 career save percentage is the fourth-best in school history, and his 1.39 goals-against average as a freshman is easily the best of any goalie to don the pads in Oxford. Don’t know what’s going on behind the scenes here and not trying to take a side for that reason or stir anything up, but it’s shame how his Miami career has likely ended, without the benefit of taking a victory lap for his final regular season home game. Good luck topping that, Hollywood. Kuraly said at intermission on Saturday that this class hopefully has a couple more memories to make before its players go their separate ways to pursue their dreams, both on and off the ice. The way this big screen-worthy regular season has gone, fans have to feel like the script has several more scenes to be written. Even if that’s not the case, it’s been an Oscar-worthy story that’s played out the past couple of months. – For five periods this weekend, Miami played decent hockey, good enough to outscore CC. The RedHawks finally got it right in the sixth and final frame, scoring three unanswered goals on 22 shots, as the puck seemed to spend half of that stanza in the Colorado College goal crease. A plus-7 goal differential is great, but a more skilled team would’ve buried some of its ample chances this weekend. – A night after racking up nearly 14 minutes of power play time vs. 93 seconds for Miami, it’s mind blowing that Colorado College took 14 minutes in first-period penalties for dust-ups with officials, including contact with a linesman. – It was listed at 3,155, but the crowd at Cady Arena on Saturday seemed larger and was certainly rocking, despite, well…OK…enough with the music bashing – it’s gotten a little better. If Miami does get back to Cady for a series against Minnesota-Duluth, we will need loud fans at the game. Forget spring break…doesn’t having the campus and the Oxford bars to yourselves with a best-of-3 hockey series sound more appealing? – Miami graduate Nick Brunker did play-by-play for this game and was fantastic, to the surprise of no one who has ever heard his broadcasts. Few have worked harder to advance their broadcast media careers, as Brunker actually got kicked out of the press box of a Cincinnati Mighty Ducks game as a high school student for trying to perfect his craft and record his own calls when there wasn’t ample room, and he later excelled as the PxP guy for the Cincinnati Cyclones. FORWARDS: A. Zach Lavalle won a battle along the boards that ultimately led to Richart’s goal, opening the scoring. Roslovic’s beautiful centering pass led to Morris’ laser one-time finish. Not sure if Kuraly intentionally tipped a pass to Sherwood for Goal No. 3 or if it was inadvertent – we’ll call it deliberate, we’re feeling generous – but what a play. Freshman Josh Melnick (this deep into a write-up this is really Melnick’s first reference?) won a boards battle to get the puck to neutral ice then stole a pass and fed it to Louis for the ENG. Lots of offensive positive here. DEFENSEMEN: A-. Good work without it two-way leader in Caito. If we had to nitpick, this group did turn it over a couple of times early but seemed to tighten up late, even as Colorado College started taking more chances in the third period (thus the 10 shots in the final 20 minutes for CC). Richart not only scored, he gloved a puck down and shuffled it ahead quickly to Roslovic, leading to the Sherwood goal. Apparently there’s nothing Richart can’t do right now. Jay Williams makes one of his 24 saves on Saturday (photo by Cathy Lachmann). GOALTENDING: A. Not as many difficult saves for Williams as on Friday, but this is a weekend the senior will likely tell his grandchildren about. Fifth-five shots, 55 saves in 120 minutes, including 24 of 24 in this one. His rebound control was excellent again, and the TV color guy mentioned that as well. It’s only the third time a Miami goalie has posted back-to-back shutouts and the first time one has blanked a team twice in a weekend. Williams’ shutout streak is now 148:52, the longest in team history. Cody Reichard held the previous mark at 141:41. David Burleigh also posted back-to-back zeroes and went 136:05 between goals against. LINEUP CHANGES: It was the same 19 as Friday for the RedHawks. Caito, Schmit and Loe missed their second straight games, while Colin Sullivan, Mooney and Ryan Siroky dressed for the second consecutive night. 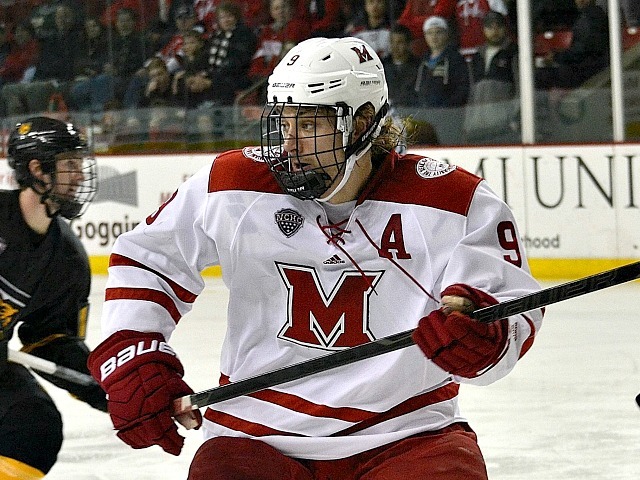 WHO: Colorado College Tigers (6-23-1) at Miami University RedHawks (13-14-3). WHEN: Friday–7:35 p.m.; Saturday–7:05 p.m.
TV: Saturday – Fox Sports Alternate (DirecTV Ch. 608). COLORADO COLLEGE RADIO: Both nights–KRDO-AM (1240) and KRDO-FM (105.5), Colorado Springs, Colo.
NOTES: The earlier series between these teams was a dumpster fire for Miami, which lost in the third period both nights and caused some internal turmoil. Colorado College started the season 0-13 before beating Air Force and then topping the RedHawks twice, but the Tigers have dropped their last five by an average of 2.8 goals. CC has had trouble scoring goals and preventing them, which explains its 6-23-1 record. The Tigers have scored just 64 goals, or 2.06 per game, with just 44 of them coming at even strength. Only one Colorado College player has eclipsed the 20-point mark, and that’s Hunter Fejes, who has 13 goals and nine assists. Fejes tormented Miami in Colorado Springs, netting both goals in the come-from-behind 2-1 win in the opener and tallying the game winner with 1:13 left in the finale. Luc Gerdes is second on the team in scoring (7-11-18), and Trey Bradley is second on the team in goals (9) and third in points (16). Jacob Nehama has been the primary goalie for CC in recent weeks, playing in six straight games and 15 of the team’s last 17. He is 6-15-0 with a 3.58 goals-against average and a decent .902 save percentage, indicating he has faced a ton of shots. Colorado College has indeed had a major shooting deficit, averaging 26.6 shots on goal while allowing 35.1 per game. The Tigers are last in the NCHC but could still move up a spot, as they are four points behind seventh-place Western Michigan. But Colorado College is just 2-12-1 on the road this season. Miami is tied with Nebraska-Omaha and Minnesota-Duluth for fourth with 25 points as those three teams vie for the final top-four spot that ensures home-ice advantage for the best-of-3 series to open the NCHC Tournament. UNO is at St. Cloud State, and UMD hosts North Dakota, so the RedHawks obviously have a great chance to move into solo control of that fourth spot this weekend. 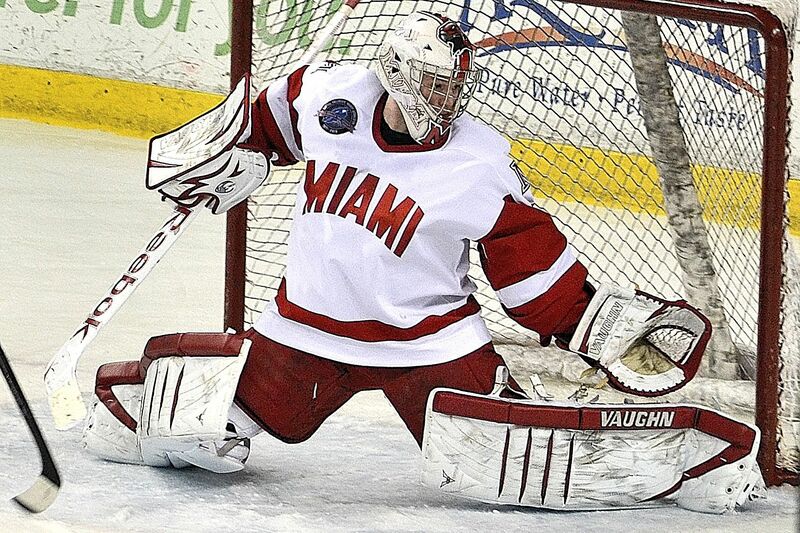 Miami’s Sean Kuraly (photo by Cathy Lachmann). These are the final home games of the regular season for Miami and the last games of 2015-16 at Cady Arena unless it can secure that fourth seed. Senior forward Sean Kuraly is plus-10 in his last 14 games, notching four goals and 10 assists in that span. Junior forward Anthony Louis has scored three goals in his last three games, and freshman forward Kiefer Sherwood has four markers in six contests. OXFORD, Ohio – Alex Gacek finished his first season of junior hockey with 33 goals in 40 games and won a league championship. He had also been selected to represent the U.S. in the prestigious Five Nations Tournament prior to the start of that 2009-10 campaign. But in the summer of 2010, at age 17, Gacek suffered a full patellar tear, ripping the ligament that connects the kneecap to the tibia completely off the bone. Two years later, Gacek limped into Oxford a shell of that standout player. But nearly 3 1/2 years later, he has become an all-around force, scoring and setting up goals, killing penalties, blowing past would-be defenders and laying out anyone that gets in his way. Gacek hails from Dracut, a Massachusetts town north of Lowell near the New Hampshire border. As a child, he told his parents while watching a Bruins game that he wanted to learn how to skate and play hockey. With pond hockey a regional institution in the area, Gacek’s father, Mark, built an outdoor rink for the family to enjoy in the winter. When he reached juniors age, Gacek was fortunate enough to join New Hampshire, a powerhouse that has won seven titles in the Eastern Junior Hockey League. The team was also within driving distance, so unlike many hockey players of that age, he did not have to move. “It was a team very much like this team: Very tight-knit, we wanted each other to do well no matter what the circumstances were, and we won a championship,” Gacek said. But that summer while working out, Gacek severely injured his knee. He tried to come back the following season but was ineffective. He was rushed back into action, which actually delayed the overall recovery process. Alex Gacek squares off while playing for Youngstown in 2011-12 (photo by Cathy Lachmann). Gacek still played in 41 USHL games in 2010-11 but he did not score a single goal and finished with just eight assists and a minus-18 rating. Even after racking up 32 points in 57 games with USHL Youngstown in 2011-12, he was not the same player he was previously heading into his freshman season in Oxford. A New Englander choosing Miami is somewhat of a rarity, since a large number of the Division I programs are in the northeast. Gacek said most people growing up in his area wanted to play for Boston College or Boston University, but neither made an impression on him. One player Gacek already knew when he moved onto campus was senior goalie Jay Williams, whom he had befriended in juniors. Alex Gacek as a freshman (photo by Cathy Lachmann). “I remember when we first got here, he had had a rough junior experience as well, and that was something we could bond over,” said Williams, who never was able to start consistently in the USHL. “But as soon as he got his confidence and kind of got his footing, he was able to get comfortable with the guys in the room and develop that trust and that bond. He’s not always necessarily on the stat sheet but the contributions he makes, night in and night out – penalty killing, defensive zone, even just generating offense, getting in on the forecheck and stuff – it’s invaluable to this team, and he’s been a big part of the success that we’ve had for four years. 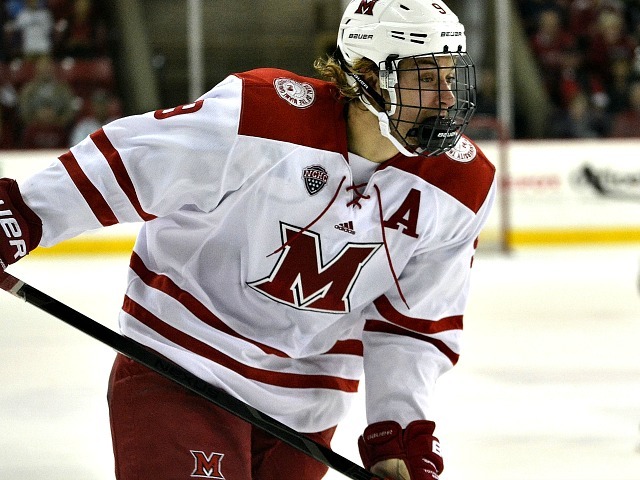 Just four games into his RedHawks career, Gacek scored his first goal at Michigan, tying the score at two early in the third period and sparking a three-goal outburst in the final frame as Miami won, 4-3. Alex Gacek heads out to Soldier Field freshman season (photo by Cathy Lachmann). Overall, Gacek was not a major points producer as a freshman or sophomore, going 3-4-7 both seasons in 73 games. But junior year, Gacek turned into a complete player. He scored five goals, including two in a critical late league game vs. Denver, and tallied nine assists. His defense also was noticeably improved, as he became a dependable penalty killer and solid shutdown forward. That surge in all aspects of play has continued in 2015-16. Gacek already has five goals and 10 assists for a career-best 15 points, and he leads the team by six in plus-minus with a rating of plus-11. Alex Gacek as a sophomore (photo by Cathy Lachmann). And he seems to have saved his best hockey for his final stretch run. Gacek has six points in his last 10 games. Gacek is one of the key penalty killing forwards on a unit that is second in all of Division I only to Yale at 92.4 percent. In his four seasons, Gacek has been in the lineup for 143 of 149 games, missing just one since his freshman year and dressing in 92 straight contests. He has 16 goals and 27 assists for 43 points and has been assessed just 42 penalty minutes. Gacek also has a career plus-11 rating. Throughout his career, NHL-caliber speed has been a trait Gacek has prided himself on. All four seasons in Oxford he has been one of the fastest skaters on the team. Alex Gacek as a junior (photo by Cathy Lachmann). Despite being 5-feet-8, another attribute of Gacek’s is his hitting ability. Giving 20 or more pounds to most players in college hockey, he has taken on countless bigger players and often sends them flying. Gacek weighs 180 pounds, which is impressive given his height. Gacek would like to continue playing hockey after this season but ultimately wants to get his Masters degree in the business field after graduating this spring. He has a 3.43 grade-point average as a sports leadership and management. He is interested in coaching when his playing days are over, and he said he has already picked a couple of coaches’ brains on the subject. Alex Gacek as a senior (photo by Cathy Lachmann). But in the meantime, he is excited about the final weeks of his collegiate career, which will hopefully culminate in an NCAA Tournament berth for the third time in his four seasons. Anthony Louis scored the first goal of the game and his team’s last one – which came in highlight-reel fashion – and that plenty of offense for Miami. The junior forward recorded a pair of goals, giving him three in two games and six in his last nine, as the RedHawks beat Western Michigan, 4-1 at Lawson Ice Arena on Friday. It was the fourth straight road win for Miami (13-13-3), which surged to the .500 mark for the first time since Oct. 30. Anthony Louis (photo by Cathy Lachmann). The RedHawks took the early lead when freshman forward Josh Melnick stole a puck in the neutral zone and lifted it ahead to Louis, who skated in and whipped a shot by goalie Lukas Hafner just 4:26 into the game. With 2:42 left in the opening stanza, senior forward Kevin Morris banged home a loose puck off of a shot by sophomore defenseman Scott Dornbrock on the power play to make it 2-0. Miami extended its lead to three when sophomore defenseman Louie Belpedio, who had his intitial pass attempt blocked, fed one to freshman forward Kiefer Sherwood, who roofed it from the side of the net 3:01 into the middle frame. Louis came in from the right wing, was held as he approached the net and still was able to lift a shot over Hafner for the RedHawks’ fourth goal 1:06 into the third period. The marker was highlighted by ESPN anchor John Buccigross on Twitter. It was just the second multiple-goal game for a Miami player this season. 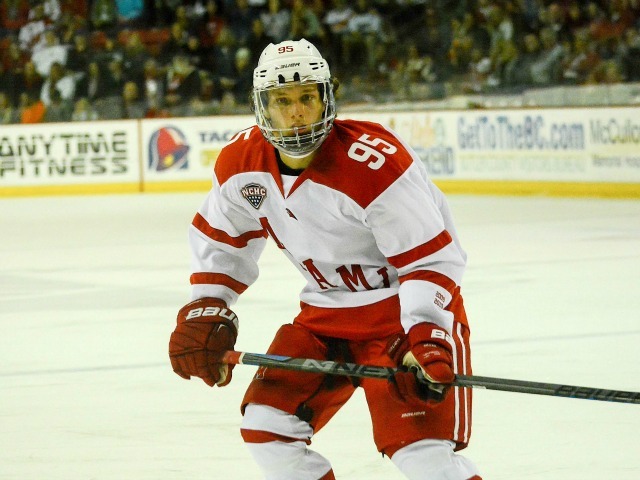 Sophomore forward Conor Lemirande recorded a hat trick for the RedHawks on Jan. 23 at Nebraska-Omaha. Just 33 seconds away from a shutout, Western Michigan (7-19-3) scored on a shot from Aaron Hadley that trickled past Miami senior goalie Jay Williams. Williams stopped 27 shots to record the win. He did not have a victory this season in calendar year 2015 but has eight already in 2016 and 44 for his career, two away from tying Connor Knapp for fourth place on the team’s all-time leaderboard. Sherwood has scored in three straight games, and Melnick has picked up a point in nine of 10. Senior forward Sean Kuraly picked up an assist to give him 13 points in nine games. Parlayed with losses by Nebraska-Omaha and Minnesota-Duluth, the RedHawks’ third straight win moved them into a tie for fourth place with both of those teams in the NCHC standings with 25 points apiece. There was more good news for Miami, which surged to 15th in the PairWise rankings. It will probably take a final ranking of 13 or 14 to ensure a trip to the NCAA Tournament via an at-large bid, coupled with a winning percentage of .500 or better, but the RedHawks were as low as the high 30s earlier this season. The teams wrap up the weekend series at 7:05 p.m. on Saturday. 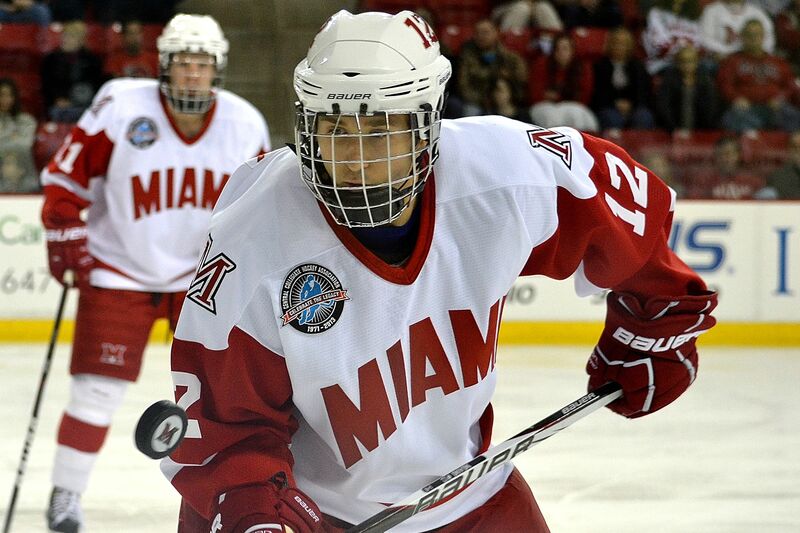 Miami returns home to host last-place Colorado College next weekend in Cady Arena’s final games this regular season. BOWLING GREEN, Ohio – Miami’s seven-game road losing streak seems like an eternity ago. The RedHawks fell behind early before scoring the final four goals en route to a 4-1 win vs. Bowling Green at BGSU Ice Arena on Friday, extending their winning streak to three games away from Oxford. MU’s last road loss came over two months ago at Colorado College. Senior center Sean Kuraly netted the game-winning goal, the 12th of his career, as he moved into a tie for third place all-time on the Miami leaderboard, tying him with Andy Miele and Reilly Smith. Kuraly finished with a goal and an assist, giving him four multi-point games in his last six contests and 12 points in his last eight (4-8-12). In the first minute, Miami senior goalie Jay Williams was forced to stop a breakaway after a stretch pass. With 8:18 left in the first period, BGSU (16-10-6) took the lead when Brent Tate tipped home a blue-line wrister from Sean Walker in the closing seconds of a power play. But the second period was kind to the RedHawks once again. Miami (12-13-3) tied it when junior forward Anthony Louis roofed a shot from the side of the net on a two-man advantage with 7:23 left in the frame. Less than three minutes later, Kuraly tipped in a change-up wrister from the blue line by sophomore defenseman Scott Dornbrock to put the RedHawks ahead for good, 2-1. That was the sixth goal in a row Miami had scored in the second period. Fortunately for the RedHawks, they bucked that trend in the final stanza. Freshman forward Kiefer Sherwood banged home a loose puck with 6:09 left in regulation to give Miami a two-goal lead. Senior defenseman Matthew Caito iced it with an empty netter in the closing minutes. Kuraly has scored four times in his last six games, and Sherwood netted his fourth in seven. Louis has pumped in four in eight games. Caito scored his 16th career goal, moving him into seventh on the school’s career leaderboard, tying him with 1996 graduate Pat Hanley. Freshman defenseman Grant Hutton recorded his first multi-point game, tallying a pair of assists. He has four helpers in his last three games after picking up just one through 25 contests. Freshman forward Josh Melnick has recorded a point in eight of nine games, finishing with one assist. Senior goalie Jay Williams stopped 21 shots to earn the win, the 43rd of his career. He is three away from Connor Knapp for fourth place all-time at Miami. The RedHawks jumped to a tie for 19th in the PairWise rankings with the win. They would likely need to be in the top 13 to be a safe bet for an at-large bid into the NCAA Tournament. Nebraska-Omaha won on Friday, moving into a tie with Miami for fifth place in the NCHC standings, and the Mavericks have a game in hand over the RedHawks. Miami is off until next Friday, when they travel to Kalamazoo, Mich., for a series at Western Michigan. First period–1. BGSU, Tate 4 (Walker, Bednard), ppg, 11:42. Second period–2. Mia., Louis 7 (Melnick, Belpedio), ppg, 12:37; 3. Mia., Kuraly 6 (Dornbrock, Hutton) 15:15. Third period–4. Mia., Sherwood 7 (Kuraly, Roslovic) 13:51; 5. Mia., Caito 4 (Hutton), eng, 18:13. 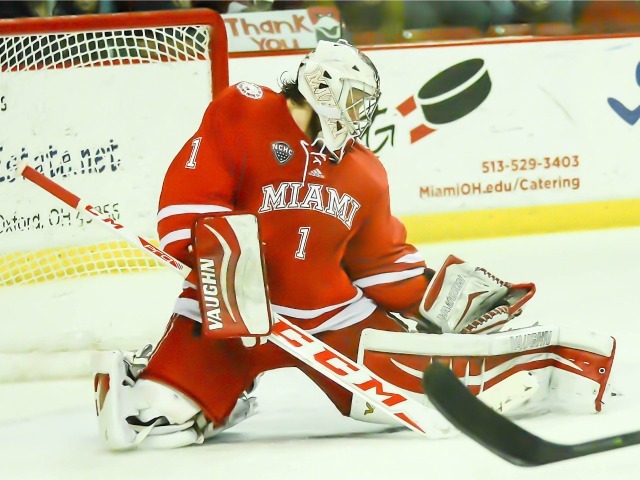 Power plays–Miami 1 for 7; Bowling Green 1 for 4. Shots on goal–Miami 16-14-19–49; Bowling Green 8-7-7–22. 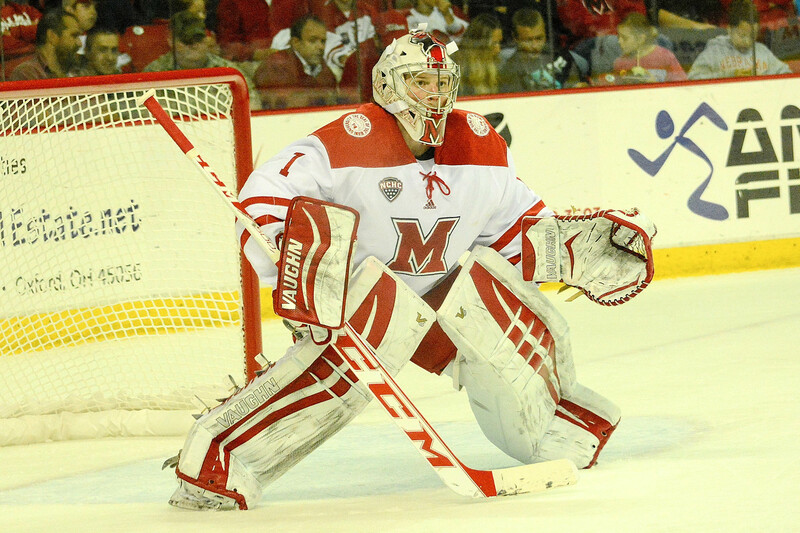 Goalies–Miami, Williams (21 of 22 shots saved); Bowling Green, Nell (45 of 49). Referees–Tommy Albindia, Brett Klosowski. Linesmen–Andrew Hempel, Frank Hempel. Attendance–4,025. Time–2:16. OXFORD, Ohio – In its second game since being assembled, the all-Columbus line accounted for a pair of goals. That was the difference on Saturday in Miami’s 3-2 upset win over No. 3 St. Cloud State at Cady Arena. It was a risky move by Coach Enrico Blasi, as the RedHawks’ offense was scoring at its best clip of the season. It was senior center Sean Kuraly scoring the go-ahead goal that made it 2-1 midway through the second, and minutes later freshman forward Kiefer Sherwood banged home the third Miami tally. Freshman forward Jack Roslovic set up the latter with an NHL-caliber pass through multiple defenders and the top of the SCSU crease. Scoring has been an issue all season, and Miami was held to one goal on Friday but quietly there is cause for optimism. Josh Melnick (right) celebrates his goal with teammate Louie Belpedio (photo by Cathy Lachmann). The Columbus line lit the lamp twice in this game. The Garden Gnome line (Josh Melnick-Anthony Louis-Alex Gacek) netted the other two this weekend. The combination of Kevin Morris and Zach LaValle have lit the lamp four times in the past seven games, and the Crash Cousins line accounted for three – all on Conor Lemirande’s hat trick – two weeks ago at UNO. This team won’t make people forget about the 1983-84 Edmonton Oilers, granted, but in a brutal six-game stretch that saw the RedHawks face UNO on the road and Denver and St. Cloud State at home, Miami averaged 3.3 goals. The back-to-back losses were tough because they were at home and every game is so important now, but ultimately Miami went 4-2 during arguably its toughest three-week stretch of the season and played some very good hockey in the process. These guys hung with the third-best team in Division I for most of the weekend. Now the RedHawks will have to take that success to the road, where they play five of their final seven regular season games. – The RedHawks did not get a PairWise boost from this win. In fact, they dropped a spot despite beating the second-ranked team in college hockey. That means it’s more likely Miami will have to win the NCHC Tournament to secure an NCAA berth. But the RedHawks have gone to the NCHC final both seasons of the league’s existence, winning one title and posting a 7-2 overall record in the conference tourney. – Ryan McKay was still not with the team this weekend. He is still on an indefinite suspension, but he is still in Oxford. Not sure what’s going on behind the scenes, but while McKay’s actions when he left his last start were clearly wrong, it’s been four weeks and he’s a senior. Here’s hoping he and the coaching staff can make amends soon. It’s hard to watch a player’s final stretch run go down like this, especially somehow who has contributed so much to this team. The Brotherhood is more than just lip service, right? – SCSU entered play with a power play north of 31 percent, the second-best clip in Division I, but Miami allowed just five man-advantage opportunities on the weekend and killed all of them. 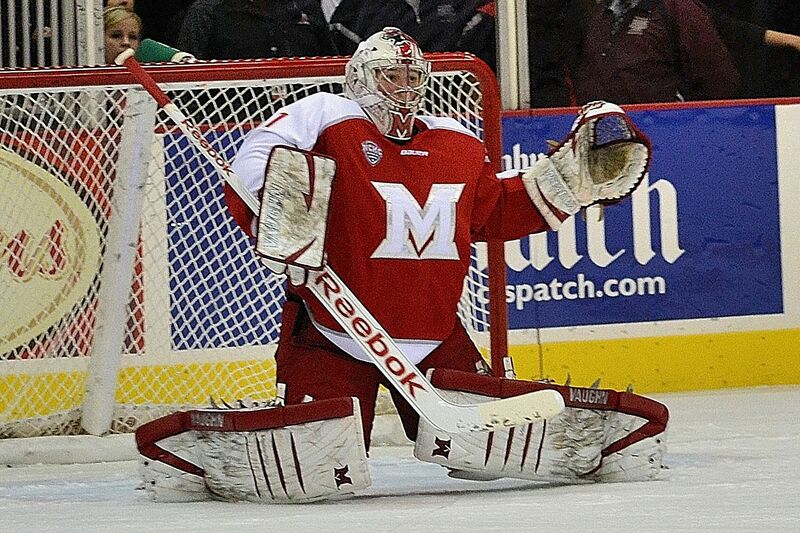 The RedHawks retain the title of college hockey’s top PK unit at 93.5 percent. – Very disappointed that only 2,534 watched Miami’s biggest home win of the season. North Dakota isn’t coming to Oxford this season, so this is the best team that visits Cady Arena. Granted Miami isn’t ranked, but really? Less than 70 percent of capacity? Still, that almost doubled the attendance for the Miami-Bowling Green basketball game played a few blocks north hours earlier. FORWARDS: B. It was a fantastic second period, especially by the newly-formed Columbus line. Melnick scored as well, but linemate Alex Gacek got beat 1-on-1 for the first SCSU goal. And yes, that fourth line was caught deep again on a St. Cloud goal. Freshmen Jack Roslovic, Melnick and Kiefer Sherwood have been three of the best Hawks in terms of offensive production recently, which bodes well for the next couple of seasons. Kuraly is the hottest with 10 points in seven games. DEFENSEMEN: B. Speaking of freshmen, really liked the play of Grant Hutton this weekend. Beyond the two assists he played very well in his own end. Colin Sullivan had a rare start and did his typical solid thing. Louie Belpedio scared everyone in the first period when he went down the tunnel but he returned and picked up a key assist. Holding SCSU to 23 shots is an impressive body of work. GOALTENDING: B+. Williams probably should’ve had the first goal with his glove, but as usual, he got better as the game went on. He stole the show in the third period with 11 saves, including several on excellent scoring chances. Williams had no chance on the tic-tac-toe second goal. LINEUP CHANGES: Blasi went with Devin Loe over Andrew Schmit on the fourth line. Loe had sat eight straight games and is another player you’d like to see on the ice more, although he went minus-1. Sullivan had not dressed in six contests and replaced Chris Joyaux, who was a scratch for the first time since opening night. 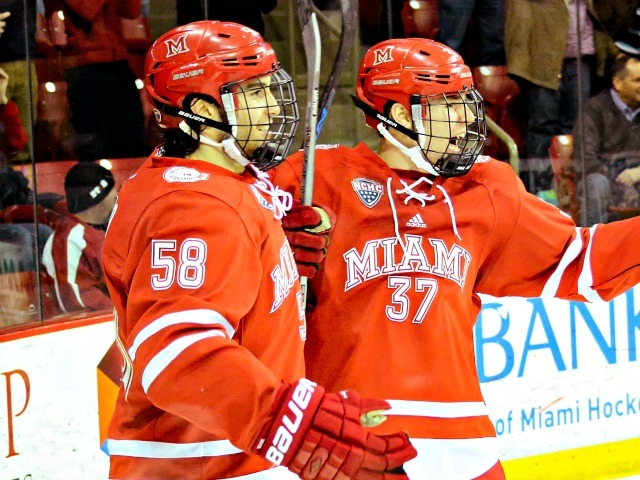 OXFORD, Ohio – A five-minute scoring outburst resulted in just enough for Miami on Saturday. The RedHawks netted three second-period goals and held off No. 3 St. Cloud State, 3-2 at Cady Arena in the series finale as the teams split the weekend series. Like Friday, the game remained scoreless until the final minutes of the first period, and the Huskies again took the early lead, as Jimmy Schuldt penetrated from the blue line to the top of the faceoff circle and wristed one that deflected off the glove of Miami senior goalie Jay Williams with 1:45 left in the opening frame. 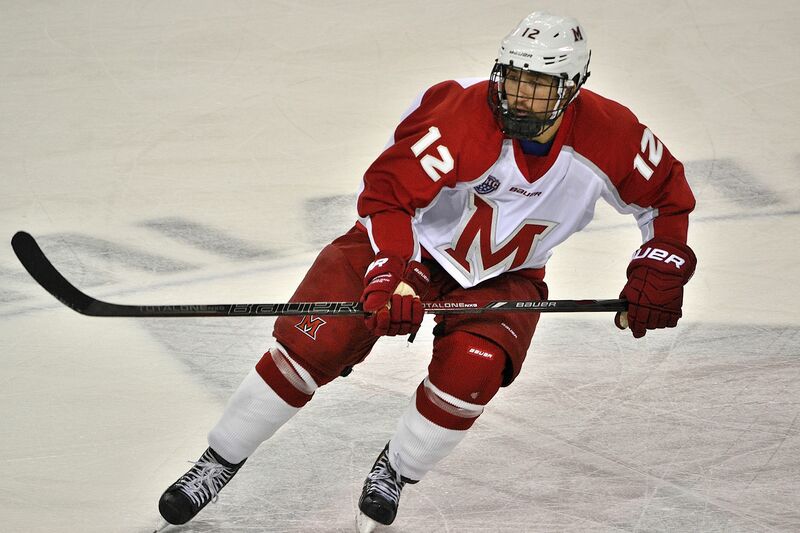 Miami’s Josh Melnick rips this shot home for the first RedHawks goal (photo by Cathy Lachmann). The RedHawks’ goal binge started 5:54 into the middle stanza when freshman defenseman Grant Hutton threw a pass through the top of the crease to freshman forward Josh Melnick, who slammed it home to tie the score. Miami (11-13-3) took the lead for good when senior center Sean Kuraly drove down the left wing and roofed a forehand shot just 1:22 later. Freshman forward Jack Roslovic threaded a pass through traffic to freshman forward Kiefer Sherwood for a one-timer that ended up in the net with 9:29 remaining in the second period, making it 3-1. Patrick Russell cut the lead to one for SCSU (23-6-1) with 6:38 left in that frame when he tapped in a pass by Mikey Eyssimont at the side of the cage. Three of the four goals in the second period were scored off of high-quality passes. Williams stopped made 11 of his 21 saves in the third period to preserve the victory, including multiple point-blank opportunities. He earned his 42nd career win and is fifth on Miami’s all-time victories list, moving to within four of fourth place. 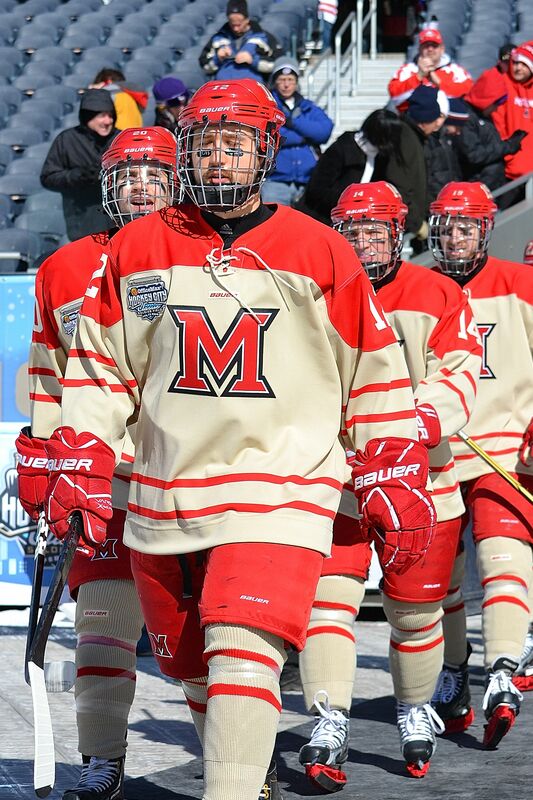 Kuraly was the only RedHawk with multiple points, finishing with a goal and an assist. He has 10 points in his last seven games, including three of his five goals this season. Melnick scored for the second consecutive game, and Sherwood has three makers in his last six contests. Despite the quality win, the RedHawks dropped one spot to a tie for 25th in the PairWise rankings. They moved into solo control of fifth place in the NCHC with 22 points, three ahead of Nebraska-Omaha and three points behind Minnesota-Duluth. Miami plays its final non-conference game at Bowling Green at 7 p.m. on Friday. 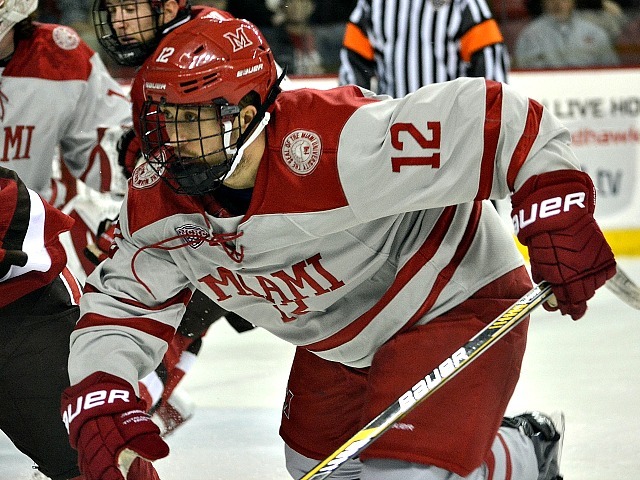 OXFORD, Ohio – Miami did come back from a two-goal deficit to tie it but ultimately saw its four-game winning streak snapped. Denver netted a pair of third-period goals en route to a 5-3 win over the RedHawks at Cady Arena on Saturday, handing MU its first loss since Jan. 9. Despite being severely outplayed in the first period, Miami freshman forward Jack Roslovic went in on a 2-on-1, faked a shot and slid a pass across the slot to freshman forward Kiefer Sherwood, who buried it with 1:42 left in the frame. The Pioneers would record the next three markers in a seven-minute window. They tied it on a tic-tac-toe passing play, capped off with a tap-in from the side of the net by Trevor Moore 7:04 into the second period. Matt Marcinew slipped one through traffic from the blue line, beating RedHawks senior goalie Jay Williams with 9:38 left in that stanza. Denver went up 3-1 over three minutes later when Quentin Shore beat three Miami players, put a shot on that was saved by Williams and followed it up with the tap-in. The RedHawks cut the lead to one with 4:56 left in the middle frame on a shot by senior forward Alex Gacek from the top of the faceoff circle that snuck inside the far post. Miami’s Sean Kuraly fends off a defender and eventually scores the tying goal in the third period (photo by Cathy Lachmann). Senior center Sean Kuraly evened it at three when he drove strongly the net and beat goalie Tanner Jaillet on the forehand less than two minutes into the third period. But the Pioneers went ahead for good less than three minutes after the tying goal when a Miami clearing attempt deflected to a wide-open Shore in the slot, and he shot over Williams’ glove for the go-ahead tally. Denver’s Nolan Zajac capped off the scoring on a blast from the blue line that found the far top corner of the net with 3:32 remaining in regulation. It was Williams’ first loss since Oct. 31. He stopped 26 shots. Kuraly led Miami with two points (1-1-2), giving him eight points in his last five games. Freshman forward Josh Melnick and junior forward Anthony Louis saw their five-game points streaks snapped. Miami is now in a three-way tie for fourth place in the NCHC with Nebraska-Omaha and Minnesota-Duluth at 19 points. The loss also dropped the RedHawks to 24th in the PairWise rankings. Miami hosts St. Cloud State next weekend. Game times are 7:35 p.m. and 7:05 p.m. on Friday and Saturday, respectively.